Every so often, you're sure, no matter where you're from, to run across an offering in a local newspaper - for it's the venue for the majority of all question-and-answer pieces with normal, everyday people - that will ask the subject being probed whom, living or dead, they'd like to have as dinner guests. It's an open-ended postulate that is supposed to reveal something intriguing about the person being asked, when, in another estimation, it should be seen as a way to give cool points and worthiness to the minds and personalities of those chosen to break bread and ladle soup slurpingly with. Many choose dignitaries - Winston Churchill or Albert Einstein - obvious choices for obvious reasons. Those who keep a Bible close to or on top of their nightstand will inevitably tab Jesus or the big G for one of their imaginary, hypothetical calligraphic invitations. Those full of athletic memories will take Mickey Mantle or Johnny U - perhaps even Rocky Marciano or Wilt Chamberlain for tales of tragedy and sluttiness, not all that typical of fare for a roundtable meal. For the musically inclined, defaults are Lennon and Beethoven, maybe not in that order. Hendrix and Jim Morrison, while awkward and out-of-place at a fanciful five-course dinner party that would be attended by big shots and dreamers, would make for some fascinating conversation and the after dinner mints probably would be bypassed for something stronger. The question can be answered an infinite number of ways and taste preferences obviously infiltrate the process individually and specifically. 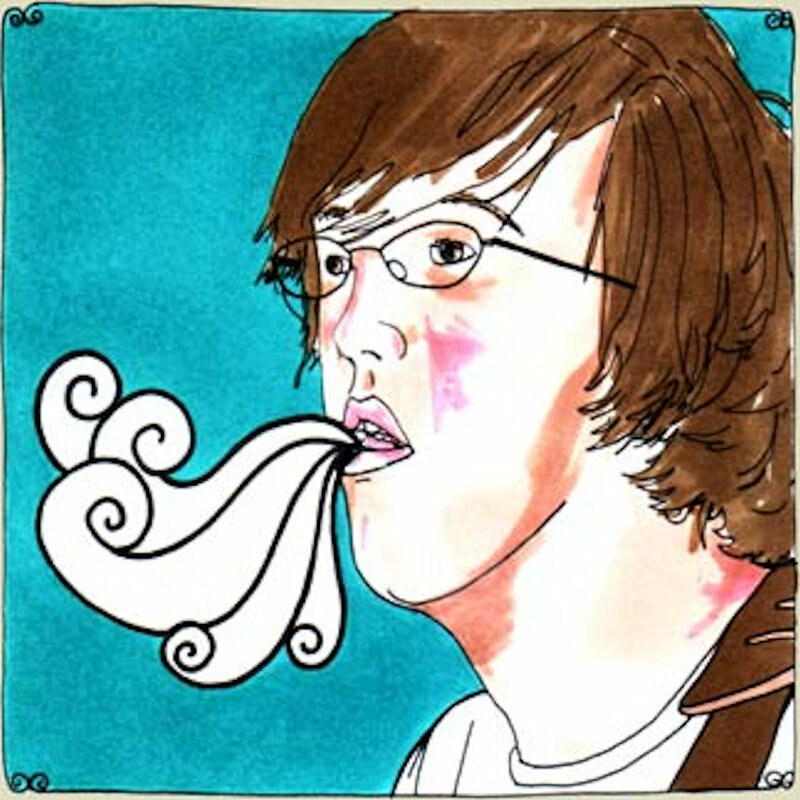 For those of you out there needing an answer to this question now or will some day in the future, let us suggest another candidate for your consideration - one Will Sheff, the lead singer of Okkervil River. Sheff would make you proud over a filet mignon and a couple bottles of expensive as hell wine. He'd work his intense intelligence - vivid and cleverly, quietly demonstrative on the near classic album Black Sheep Boy and the band's latest The Stage Names, a dressed up picture of life that occurs interestingly enough predominantly outside of any spotlights and confetti yet maintains a Hollywood-ish template, albeit one involving original thought. Sheff and his delicate, yet husky and weathered tales of the tattered remains of cheerlessness or breath-taking exasperation (all of the same measure and dose) have the same tincture of amber and grey - the light falling upon them just so and casting them in an apt candor, for those are the colors that do it, those of the drab afternoons when nothing much is happening and the very beginnings and ends of the day's sunlight. Aren't they when the soul feels most revealing? Sheff, who cuts the figure of a man hard at work thinking and contemplating things that you and I are not, uses his eyes and his head as one giant lens, scanning his surroundings, milking the details for all of their nectar and the bitter aftertastes. He then sees things and people out in spectacularly lively and provocative scenes that needn't set designers or grips to hold hovering microphones or cue the action. Those that he puts into his incisive lyrics are fully thought out and - were this a novelist - would be the results of countless drafts and rewrites, sleepless nights, cartons of cigarettes, way to much bourbon or other choice hard stuff, depression and time - minutes, hours and days just laid out with nothing to fill them. These people are real and fictional both, conceptualized and yet bearing all of the requisite traits needed to be considered genuine and real - of flesh and bone. The personalities wear like the smattering of different ones that we sometimes invoke ourselves. It's not dress-up because the personalities are more mirrored than that, less staged and less propped. It's a proper introduction to the spirits that bang out the hollow pangs of grief and longing inside those red inner walls, not the "fake masterpiece" that comes "serenely dribbling" from speakers in Okkervil's debut single from the new record. Sheff acts, directs and inspires - he's the guy choosing the camera angles, giving motivational-this-is-how-you're-feeling-at-this-point advice and then ripping off the headphones and tearing out onto the soundstage himself, like Max Fisher putting the popcorn down and suddenly becoming the wrestler. He's the consummate songwriter, who writes what he knows and just as importantly writes what the rest of him and all of his surrounding costars teach him. Sheff at a dinner party is a full house, just roll sound. Will Sheff: It depends. When I'm on tour I spend a good six to ten hours a day in the van. That's a lot of time with not very much to do, so when I'm on tour everyone in the band tends to burn through books and pass them around to each other. When I'm not on tour I read far less; I'm usually trying to get as much done as possible before I have to get back in the van. WS: I wasn't aware of that song being on "The Muppet Show." Was it really? I'm more familiar with it from the original Randy Newman version and Harry Nilsson's subsequent cover. I do love "The Muppet Show," though, and I used to watch it all the time as a kid. I very distinctly remember an episode where all the Muppets got murdered - it was one of those deals where all the lights went out and there was a scream and then they'd come back on and Gonzo would be slumped over with a knife sticking out of his back - and at the end they all went to heaven. I really don't believe I was dreaming this, that it really happened. I went on the Internet and apparently there was a murder mystery episode that sounded like my memory, but the webpage didn't go into the details very much. In any case, that episode probably influenced my young mind a lot because it was such a shock to see Muppets dying violently. I think I'd probably want to hang out with Janice, the chick guitar player from Doctor Teeth and the Electric Mayhem. She seemed pretty cool, like a stoner hippie band chick with Joni Mitchell hair, kind of locked in that mellow guitar player slouch. I think I like Kermit the best, though, despite the fact that it's so incredibly obvious of a choice. He just seemed like such a soulful guy. Plus, he sang "It's Not Easy Being Green" and "The Rainbow Connection," which are incredible songs. In my version of "The Muppet Show," Kermit and Janice would have been going out. I bet there would have been a lot less drama with Miss Piggy out of the picture. Relationships shouldn't be that much work. WS: I love movies, and in fact I wanted to be make them all my life, far before I ever dreamed of being a musician. My dad used to teach a film class, and he had all these film books lying around and I used to sometimes sit in on his classes in lieu of being babysat. I guess with The Stage Names I wanted the characters to be embedded in an artwork, but not realize it. You know, like the Beatles line, "Though she thinks that she's in a play/She is anyway." Or in "Five Years" when Bowie sings, "I think I saw you in an ice cream parlor...don't think you knew you were in this song." I think there's a tension, though, when you realize that people in real life don't act like they do in movies. They're not as beautiful, not as witty, not as cool, and it's so true as to be a clichÃ© in itself to point out that they don't all get to have happy endings or even satisfyingly dramatic tragic endings. WS: You know, I just happened to have it on my mind and I threw it out there as a suggestion. Everybody in the band liked the name, and it just stayed even though I didn't like it all that much. In some ways, one of my goals in writing The Stage Names was thematically to reclaim that name, to go back into the story and find a reason why a band would have a fool name like that anyway. WS: I think you can take a series of moments from anyone's life and it will make an amazing, great story worthy of any movie. The thing is, that story was put together by including some moments, excluding others, and then cutting the action off at the most dramatic or satisfying point. I feel like we probably only remember 10-percent or less of what happens to us on any given day, and most of the time it's the most exciting 10-percent. WS: I haven't been living in Austin these days, but all my stuff is still there in a storage unit. Maybe that means my neighborhood is the storage unit. The best thing about the neighborhood my storage unit is in - which is a pretty uninspiring neighborhood otherwise - is that there's a wonderful Vietnamese deli across the street called TÃ¢m, which is run by two sisters who are extremely sweet and will tell you all about every dish and what it is and where it comes from. It's one of my favorite restaurants in Austin and definitely my favorite Vietnamese restaurant I've been to.